One of the injuries a victim can suffer in a car accident or slip and fall is an injured or broken arm. Arm injuries, particularly fractured and broken arms, are more common in slip and fall and other personal injury cases than car accidents. But arm breaks and fractures do commonly occur in high impact car and truck accidents and are typical in motorcycle accident claims. These injuries in a car crash recently received attention when a major league pitcher broke his arm in a car crash. 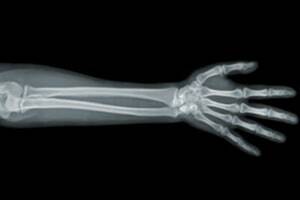 Still, a broken arm or other arm injury in a car accident most commonly occurs when the victim is a pedestrian. The average settlement value of the broken arm, forearm, wrist, elbow and hand cases is going to depend on the degree on whether the injury is permanent. A clean brake they heals in six weeks is going to have a very different value than an injury that continues to the day of settlement or trial. Our lawyers also see a lot of elbow injuries in car and truck accidents. The elbow bone is vulnerable. It is not protected by muscle or fat and if it takes a hard hit, it can fracture or break. When a broken elbow collides with the triceps muscle, surgery is usually required. A common elbow injury in car accidents involves the radial head. It's the ball of the forearm where it connects to the elbow. A serious car accident can cause breaks in the neck and head of the radius. The radius can also get jammed, causing tendon damage. 2013, Maryland (Anne Arundel County, Circuit Court): $56,392 Verdict. Two Plaintiffs are involved in a motor vehicle accident and suffer neck, back, and arm injuries. The defendant driver had veered across the center line and struck the plaintiffs' vehicle. One plaintiff is transported by ambulance to the hospital, and the other plaintiff seeks medical treatment a week later. The defendant alleges the plaintiffs had pre-existing injuries before the accident. The plaintiffs file a motor vehicle negligence suit, and the jury awarded the plaintiffs $26,084 and $30,308 respectively. 2011, Maryland (Baltimore County, Circuit Court): $100,000 Verdict. Plaintiff loses control of his vehicle and crashes into a jersey barrier. After the crash, the vehicle was partially in the left lane of travel. The defendant driver struck the plaintiff's vehicle resulting in the plaintiff suffering a fractured hand and near amputation of his dominant arm due to a severe laceration. Plaintiff requires a surgical repair due to the arm laceration and has significant scarring. Plaintiff alleges the defendant failed to properly observe traffic and could have avoided the accident. A jury awards the plaintiff $100,000. 2011, Maryland (Harford County, Circuit Court): $47,600 Verdict. Plaintiff is rear-ended by the defendant on the Bellaire bypass. The plaintiff suffers a serious arm injury with ulnar nerve damage that requires a future nerve transposition surgery. Defendant driver admits liability for causing the accident; however, alleges the plaintiff's injuries were not caused by the vehicle accident. A jury awards the plaintiff $47,600. 2010, Maryland (Baltimore County, Circuit Court): $50,813 Verdict. Plaintiff, while driving at night, strikes a construction container that was placed on a residential street without warning signs or lights. The plaintiff suffers a fractured hand and a concussion from the collision. Defendant Construction Company claims the plaintiff was aware of the container on the street and should have stopped before colliding with the container when seeing traffic coming from the other direction. A jury awards the plaintiff $50,813. 2010, Maryland (Baltimore City, Circuit Court): $68,734 Verdict. Plaintiff is traveling through an intersection when defendant runs a red light and crashes into the plaintiff's vehicle. Plaintiff suffers a serious elbow injury and settles with defendant's insurance company for an undisclosed amount. Plaintiff alleges his damages from the motor vehicle accident exceeds the policy limits and brings an underinsured motorist claim against USAA. In a bench trial, the Judge awards the plaintiff $68,734. 2016, Texas: $41,000 Settlement. A passenger in a car suffered a broken arm as the result of the negligence of the driver of the vehicle. 2016, Connecticut: $74,077 Verdict. Plaintiff is driving her vehicle when she is sideswiped by the defendant driver. The defendant was backing out from a driveway. Plaintiff suffers multiple injuries, including an injury to her wrist. Plaintiff responds to the emergency room and is diagnosed with soft tissue injuries and received chiropractic treatments. Defendant claims that the plaintiff was comparatively negligent and alleges the plaintiff's injuries were pre-existing. A jury awarded the plaintiff $74,077. 2016, Alabama: $40,000 Settlement. Plaintiff is involved in a motor vehicle accident while traveling on-the-job. Plaintiff suffers multiple injuries including right shoulder, arm, and hand injuries. Plaintiff files a claim for worker's compensation; however, the defendant employment company alleges the injuries pre-existed the collision. The parties proceed to mediation and the claim is settled for $40,000. 2015, Florida: $100,000 Verdict. Plaintiff is stopped at a traffic light and is rear-ended by the defendant driver. Plaintiff suffers from injuries, including right shoulder and elbow bone bruising, partial rotator cuff and tendon tears, right elbow ulnar nerve thickening, and abnormal nerve signal strength. Defendant alleges the injuries were pre-existing conditions from overuse and repetitive movements and were not caused by the vehicle accident. A jury awards the plaintiff $100,000. 2015, Connecticut: $1,400,000 Verdict. Plaintiff is traveling when she is struck head-on by defendant driver. Plaintiff is transported by an ambulance to an emergency room and diagnosed with multiple injuries, including a mid-shaft fracture of the left ulna of her dominant arm. Plaintiff has multiple appointments with her primary care physician, orthopedic surgeon, and physical therapy sessions. Defendant alleges the broken arm is from a prior fall and not related to the vehicle accident. A jury awards the plaintiff $1,400,000 in past medical costs and for past and future pain and suffering. 2015, New Jersey: $170,000 Settlement. Plaintiff is traveling northbound on a highway when he is struck behind by an oil delivery truck. The collision propels the plaintiff's vehicle forward and is then struck again by the same oil delivery truck. Plaintiff is transported by an ambulance to an emergency room and X-rays reveal fractures to both wrists. Plaintiff later develops bilateral carpel tunnel syndrome in his wrists. The defense acknowledges the broken wrists were due to the accident; however, they disputed the causal relationship of his other injuries. The case settles in mediation, and the plaintiff receives $170,000. If you have suffered an arm or shoulder injury in an automobile or truck accident and want to consider a lawsuit or a claim for an out-of-court settlement, call one of our lawyers at 800-553-8082 or click here for a free no obligation Internet consultation.